Short story writer and novelist Reginald McKnight will give the annual Phillis Wheatley reading on Oct. 19 and hold a colloquium with Emory students on Oct. 20. 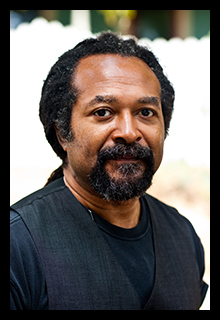 Short story writer and novelist Reginald McKnight is the first writer in the 2015-2016 Creative Writing Reading Series. McKnight delivers the Phillis Wheatley Reading Monday, Oct. 19, at 6:30 p.m. in the Jones Room of the Woodruff Library. McKnight is the recipient of the prestigious O. Henry Award for short story, the Drue Heinz Literature Prize, the Whiting Writers Award and many other awards and prizes for his body of work. His novels include “He Sleeps” (2002) and “I Get on the Bus” (1990). He is the author of short story collections “Mustapha’s Eclipse” (1988), “The Kind of Light that Shines on Texas” (1992), and “White Boys” (1999), as well as editor of two non-fiction collections, “American Wisdom” (1994) and “Wisdom of the African World” (1996). In addition to writing, McKnight has been a professor of English at the University of Pittsburgh; the University of Maryland, College Park; Carnegie Mellon University; and the University of Michigan, Ann Arbor. He is currently Hamilton Holmes Professor at the University of Georgia in Athens. McKnight will also participate in a colloquium with Emory students on Tuesday, Oct. 20, at 2:30 p.m. in the Calloway Center on Emory’s campus. McKnight will take questions from students as well as discuss his life as a writer and teacher. The Phillis Wheatley Reading with Reginald McKnight is free and open to the public. A book signing and reception with the author will follow the reading. This event is co-sponsored by Emory’s Department of African American Studies. For more information about the Creative Writing Reading Series, or the Creative Writing Program at Emory, visit creativewriting.emory.edu.